When you create installations with the Visual Installer setup tool you can choose between creating an installation with a graphical setup screen (setup window) in the background or an installation that only shows dialog boxes. The graphical setup screen can cover the whole screen or just a part of the screen with a height and width that you specify. On a graphical setup screen you can place a title, pictures, text boxes, a process gauge etc. Creating an installation that only shows dialog boxes, as in a wizard, is also possible and is a standardized way to present user interfaces for setup programs, and you are free to choose which visual style that you want to your setup programs. Whether you should use a setup screen or not depends little of what type of product you install. A setup screen will make a good first impression because this gives you the opportunity to show some impressive graphics during the installation. But if you install small utility programs or very technical programs, then maybe it is best to only show dialog boxes during the installation process. Below we show some examples of installations created with Visual Installer that uses and not uses a graphical setup screen in the background. 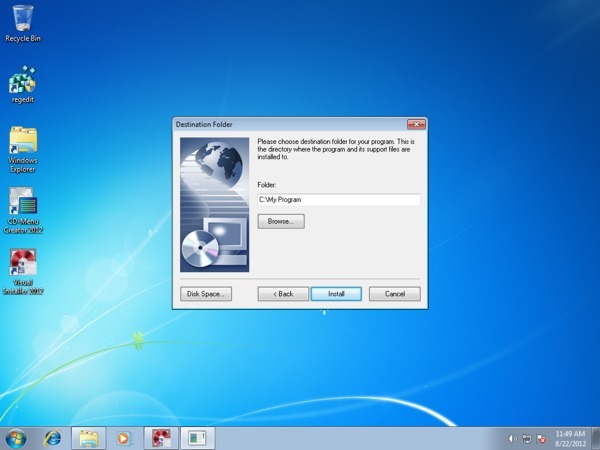 The picture below shows an installation created with Visual Installer where no setup screen is shown in the background. This is a standardized way to present user interfaces for installation programs. The dialog box below asks for a destination folder. In the picture below a graphical setup screen, that covers the whole screen, has been added to the installation. The setup dialog boxes are shown on the setup screen. The dialog box below asks for a destination folder. Visual Installer supports also silent installations. A silent installation is an invisible installation with no user interface and no user interaction at all. The files are installed according to the settings that you have specified in your installation project.